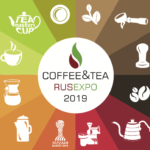 From 13 to 15 March in Moscow there will be held Coffee & Tea Russian Expo 2019 (CTRE). CTRE can be considered as one of the largest events for the industrial production chain from bean and leaf to cup in coffee & tea segments in Russia and other CIS countries. The event is a unique platform, which unites an exhibition space with over 130 companies, business program, coffee and tea competitions, cuppings and educational seminars. Within 3 days in the frame of CTRE will be conducted more than 150 events which are visited by more than 6000 concerned professionals.